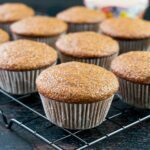 These raisin bran muffins are absolutely scrumptious and good for you. They are soft and moist, low in fat, and packed with fiber. Preheat oven to 375F and line a regular size muffin pan with 12 paper liners. In a large bowl, toss together the wheat bran, flour, baking powder, baking soda and salt. Set aside. In a medium bowl, whisk together the oil, molasses, sugar, eggs, milk and vanilla. Add the wet ingredients to the dry ingredients and mix until combined. The batter will be thin and lumpy. Fold in the raisins. Divide the batter evenly into the 12 paper liners. The batter can be prepared a day in advance and refrigerated overnight. When ready to bake, preheat the oven, give the batter a stir and bake as instructed. Leftovers can be stored in an airtight container at room temperature for up to 3 days. These muffins also freeze well. Thaw overnight at room temperature.